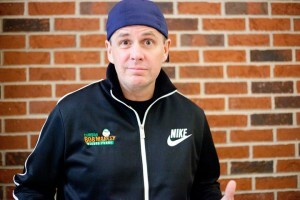 The RFA is proud to host Maine Comedian Bob Marley for another great evening of comedy! General Admission tickets are now on sale at BMarley.com. Wine/Beer and snacks will be available for purchase both before and during the show. Bob loves being a comedian. He’s wicked good at it! He lives in Maine which is the best state in the world maybe even the universe. He’s featured regularly on Sirius XM radio and he even won their Superbowl of Comedy. He has put out over 20 comedy CD’s and DVD’s. He was inducted into The Guinness Book of World’s Records for “the longest stand up comedy show by an individual” at 40 hrs of straight stand up! He’s been on over 100 tv shows including Leno, Letterman, Conan, Jimmy Fallon, Craig Ferguson and Comedy Central to name just a few. He co­starred in “Boondock Saints” I and II “All Saints Day” playing Detective Greenly. He has toured the U.S., Europe, Canada, Kuwait and Iraq. That’s about it!